A round-up of the day’s news from South Africa. The South African Revenue Service says it has won a tax judgment against expelled African National Congress Youth League leader Julius Malema. Spokeswoman Marika Muller says the firebrand ex-youth leader owes R16 million in unpaid taxes. That big tax bill followed the issuing of an arrest warrant for Malema. He is expected to appear in court this week to face charges relating to the awarding of tenders in his home province of Limpopo. Separately, the Hawks are investigating charges of incitement against Malema since he became a vocal supporter of the wildcat strikes taking place in the platinum and gold sectors, repeating his calls for the nationalisation of South Africa’s mines. The Democratic Alliance is calling for an investigation into tenders awarded by the University of Limpopo to the Julius Malema-aligned Friends of the Youth League. The DA’s higher education spokeswoman, Annelie Lotriet, said she was writing to the parliament portfolio committee head to request a probe into reports that the university is using multi-million-rand tenders to fund Malema’s allies. Her move follows a report in the Mail & Guardian that the university awarded a R27.8 million tender to Malema’s former driver and another lucrative three-year lease for dining facilities to a founder of the FYL. Cape Town’s mayor says the city has renamed Gugulethu’s notorious NY1 “native yard” road as Stephen Biko Drive. Mayor Patricia De Lille said the renaming process was in line with Biko’s philosophy as it replaced terms from the past, associated with inferiority, with names associated with power. The mayor said naming the road in Biko’s name was an “apt tribute” and that it formed part of a reconciliation programme that “tries to shape a better future from a divided past”. “It is by building, brick by brick, the Cape Town of tomorrow that truly belongs to everyone,” De Lille said. The Congress of Traditional Leaders of South Africa has said it believes Zulu King Goodwill Zwelithini gets preferential treatment from the government. Congress head Phathekile Holomisa said in a report the “Zulu king is treated differently from the Pondo king, the Pedi king, the Ndebele king and the Venda king”. Zwelithini recently asked the provincial government for R18 million to build new royal houses. Auditor General Terence Nombembe has reported irregular spending of millions of rands by Zwelithini’s royal household. The Sunday Tribune reported there had been the irregular spending of R6 million and the use of an overdraft of R10 million. The Zulu royal household has an annual budget of R55 million. Nombembe in his report noted a R600,000 grocery bill and R26,000 spent on livestock vaccinations and food supplements. The finance ministers of South Africa and Zimbabwe met late last week to discuss how South Africa could support Zimbabwe’s economic recovery. Proposals included budget support grants, a line of credit and export credit facilities. But the DA’s spokesperson on international relations and cooperation, Ian Davidson, said South Africa should impose conditions on the money, said to be in the region of R100 million. The boxer was shot by gunmen who raided the Thatch Haven Country Lodge in Brits, North West, on Saturday night. Beeld reported that Sanders died while shielding his 15-year-old daughter from the gunfire. Sanders temporarily held the WBO heavyweight title in 2003, after a shocking second-round knockout of champion Wladimir Klitschko. The arrest of a globally renowned former professor of paediatrics at the University of Cape Town on charges of manslaughter has outraged medical professionals. Professor Cyril Karabus was arrested while in transit in Dubai in August while returning from attending his son’s wedding in Canada. He was charged for the death of a three-year-old cancer patient after he operated on the child 12 years ago in Abu Dhabi. Karabus was tried and found guilty of manslaughter in his absence, but the conviction was later overturned. Now he is to stand trial for the same charges. 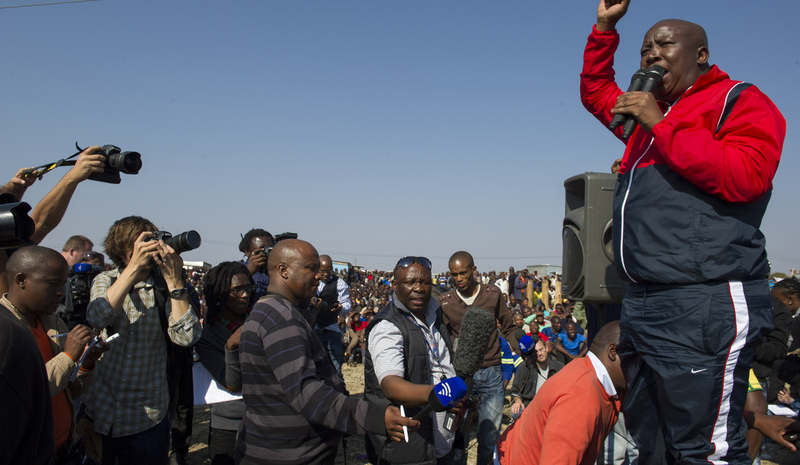 Photo: Striking Lonmin miners were addressed by strike leaders and the expelled ANC Youth League leader Julius Malema. Wonderkop, Marikana, North West Province. August 18, 2012. Photo Greg Marinovich.